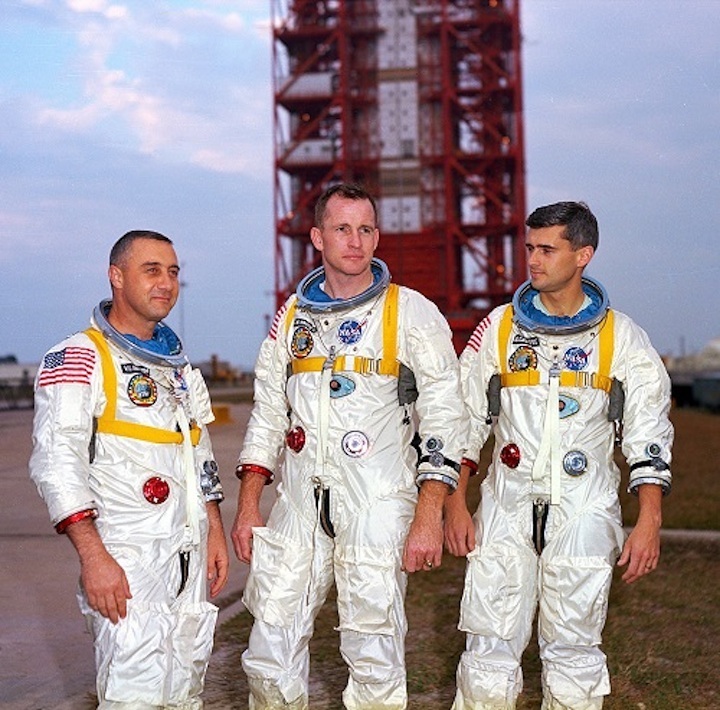 The National Defense Authorization Act passed by both houses of Congress calls for the construction of a memorial marker to the crew of Apollo 1 at Arlington National Cemetery. The measure awaits President Donald Trump’s signature. The United States Army will lead the effort to create the memorial in consultation with NASA, the Commission of Fine Arts, and the Advisory Committee on Arlington National Cemetery. Astronauts Virgil I. “Gus” Grissom, Edward White and Roger Chaffee were killed when a flash fire swept through their Apollo 1 command module during a practice countdown on Jan. 27, 1967. The astronauts had been scheduled to fly the first manned test of the spacecraft in Earth orbit the following month. Grissom was one of the original seven Mercury astronauts who became the second American in space aboard Liberty Bell 7 and commanded Gemini 3, the first manned flight of that two-person spacecraft. White became the first American to walk in space during the Gemini 4 mission. Chaffee was scheduled to make his first spaceflight aboard Apollo 1. The fire resulted in major overhaul of the troubled Apollo command module. The first manned flight of the Apollo program did not occur until October 1968, more than 20 months after the fire.